As it voted to lease the old family courthouse building to Jewish Family Service to shelter migrant families, the County Board of Supervisors also floated suing the federal government over how it’s handled the release of migrant families into San Diego. The board will consider taking action at its Feb. 12 meeting. 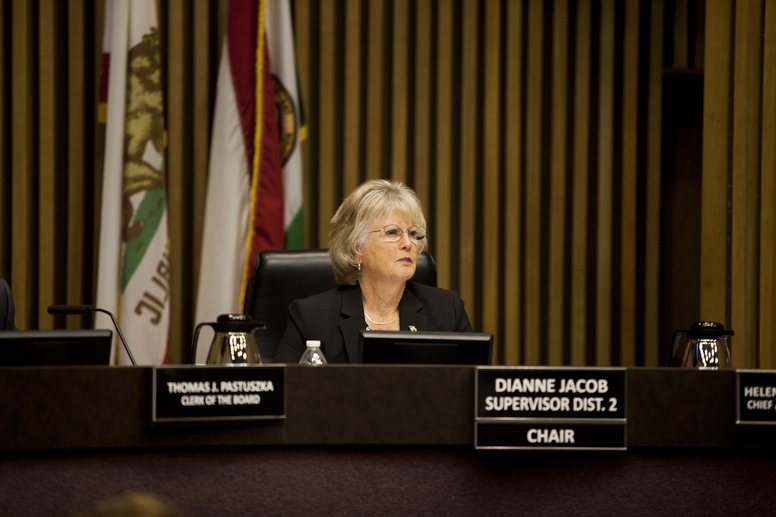 County Supervisor Dianne Jacob wants to sue the federal government over the end of its “Safe Release” program, which has resulted in thousands of asylum-seeking families being released in San Diego, often with scant resources or a place to go. In late October, the Department of Homeland Security changed how it releases migrants into the country. When families turn themselves in at a port of entry to request asylum or ask Border Patrol agents for asylum after they’ve crossed into the country illegally, they spend a few days in custody and then are released. Before the October change, ICE previously reviewed migrant families’ post-release plans, ensuring they had travel arrangements to connect with a sponsor elsewhere in the United States – typically a relative or friend willing to receive them and who could ensure they go to their immigration hearings. But ICE has stopped confirming those plans amid the uptick in families requesting asylum along the U.S.-Mexico border. The agency has said it no longer has the capacity to conduct those reviews. As a result, roughly 5,200 individuals have been left in San Diego without shelter, resources or transportation. Local nonprofits and service provides, like the San Diego Rapid Response Network Coalition, stepped up to provide temporary shelter, medical screenings and care and transportation arrangements for the families to join relatives and sponsors in other parts of the country. As the service providers’ resources have dwindled and with the clock ticking on when they must vacate their current shelter location – the fifth since October – they’ve turned to the city, county and state for solutions. On Tuesday, the County Board of Supervisors voted 4-1 to lease the old family courthouse building to Jewish Family Service to continue shelter operations until Dec. 31, 2019. All of the supervisors chided the federal government for how it’s handled the release of migrants into San Diego. The supervisors, service providers and most of the speakers at Tuesday’s meeting expressed concern that failing to address the issue could compound existing problems that plague the region, such as increasing its substantial homeless population, risking another public health crisis like the 2017 hepatitis A outbreak or leaving more people vulnerable to human trafficking. San Diego County Sheriff Bill Gore and District Attorney Summer Stephan wrote letters to the board, encouraging supervisors to support the permanent shelter. Supervisor Jim Desmond was the sole vote against the measure, citing the cost to San Diego County taxpayers. “Quite frankly I’m OK with the shelter, but what I’m not OK with is that today’s action still leaves that burden on San Diego County taxpayers,” Desmond said. While the shelter itself won’t cost the county money, since Jewish Family Service has agreed to cover the operational costs, the county has been providing full-time medical staff to conduct screenings during the shelter intake process. Those screenings have cost the county $350,000 since they began on Dec. 20, Desmond said. If that support continues through December 2019, it will cost roughly $4 million. Jacob voted to support the shelter, but agreed that the cost burden was an issue. “[Immigration and Customs Enforcement] is basically just dropping these people off with nothing – no shelter, no medical care, no travel assistance and then it’s been up to the county and all of you to help these folks,” she said, referring to the local service providers who have been running the current shelter. She said she would be placing an item on the board’s next closed session agenda, on Feb. 12, to pursue litigation against the federal government for ending its “Safe Release” program, not only to address what she views as the cause of the crisis, but to compel the federal government to reimburse the county for those costs. In his proposed state budget, Gov. Gavin Newsom allocated $5 million in onetime funding to address immigration-related emergencies such as the immediate need for a migrant shelter. Newsom also proposed an additional $20 million to establish an Immigration Rapid Response Program to help community-based organizations provide services for immigration or human trafficking emergencies. State legislators from the San Diego region have been urging the Legislature to act quickly to release the $5 million. On Tuesday, the Assembly Budget Committee approved the recommendation. But Jacob and Desmond remain concerned about the cost to the county. Such litigation could also impact border communities in other states that have been struggling to manage the releases of migrant families. Jacob also suggested that perhaps the state of California would be willing to join in such an action. “We wouldn’t be here today if the federal government had not failed to do its job,” Jacob said. Correction: An earlier version of this post misstated the potential cost of continuing medical screenings at the migrant shelter through the end of 2019. It could cost $4 million.